James Risdon, Music officer (Accessibility) at RNIB, talks about new braille resources to encourage young people with vision impairment to discover the joy of learning music. Your school's visiting piano teacher comes to you to say that Jimmy, her star pupil, would like to enter grade one piano next term. "Fantastic news," you think. Then the teacher asks you how to get the exam pieces in braille. It's a few years since you had a braille music student so you turn to Google. More in hope than expectation, you search for "ABRSM [which is the exam board of the Royal Schools of Music] piano exam pieces in braille". To your great joy, you are directed to a page where all the piano exam pieces for 2017-2018 are available to download free of charge. There are even embossing instructions so you can set your embosser correctly. By the time Jimmy comes for his next piano lesson, the piano teacher has two copies of the braille music: one for Jimmy and one so she can follow what Jimmy is reading. Jimmy has also taught himself a little braille music with a book his mum found on the RNIB Library called "Braille music for beginners: for the piano" but he soon finds several signs he cannot understand which is frustrating. The teacher knows a little braille but no braille music. You return to Google and search for "learn braille music". The first result is to RNIB's braille music page from where you see a free braille music course specifically for sighted learners. It's also free of charge. 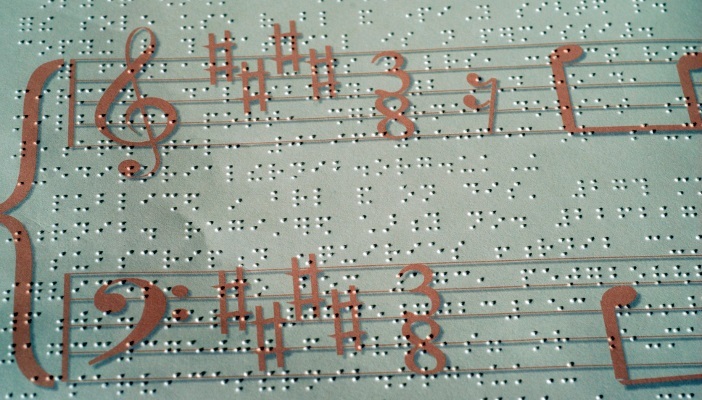 The teacher is interested to learn the basics of braille music and downloads the course. Within a few weeks she has enough understanding to annotate her braille copy with the print signs so she can help Jimmy. In time, Jimmy decides to try reading the BRF files (Duxbury’s braille file format) on his braille notetaker, which means he never has to find his place on the paper. It's also one less thing to forget to bring to the next lesson. Jimmy makes excellent progress and enjoys discovering braille music with his teacher and independently.